Club de Golf Valderrama is generally thought of as the finest golf course in mainland Europe and I have no reason to argue with that description. 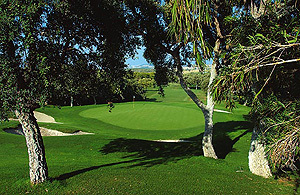 It has been voted No.1 in Europe by Golf World for several years. It is beautifully presented, in immaculate condition and extremely difficult to play. Unless it has changed in recent years there are only a couple of hours a day, around midday, when visitors are allowed to play the course. Each group MUST pay for a “caddie” who is there to protect the course rather than carry your clubs but he will offer some good advice on approach shots and putting lines. The cork oaks are so close to the edge of the fairways that even if you just roll onto the semi you may well not have a shot other than one to just put yourself back on the fairway. Nearly all the greens are crowned and very fast so it is essential to ensure that you do not pass the hole by more than a few inches. The 17th is notorious, and justifiably so, and the 11th is just impossible to play for the average golfer! Well worth the visit but be ready for a hefty green fee. 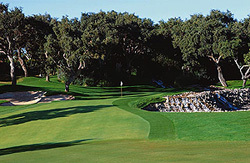 You will also need your handicap certificate and, when we played, Valderrama operated maximum handicaps which were then 24 for men and 30 for ladies. Booking is essential: Tel. 956 791 200 - www.valderrama.com from which the photos are taken.